Students from the Corinth Elementary Kids2Chef program recently impressed Lake Cities Education Foundation Board Members with an incredible hand-made lunch. The elementary-aged children had spent considerable time planning an elaborate meal to express their appreciation for funding a grant that their teachers, Cindy Medlicott and Anne Waidelich, had written to provide materials for their after-school program. The Board could not have been more appreciative of the time they had put in to pulling off such a thoughtful surprise. From the place setting to the food, no detail was overlooked by the dedicated students from Corinth Elementary. They had prepared a healthy and well-balanced meal that included a nutritious salad, and a lunch including a starch, protein, and vegetable. The meal even included a delicious dessert. The $5,000 grant awarded to the Corinth Elementary Kids2Chef program will support them in purchasing necessary ingredients and supplies needed for their upcoming cooking competition. By actively engaging children in the cooking process, their participation in the program will open up many learning opportunities and has the potential to impact them long-term. They will learn about nutritional food choices, a variety of cultures and the vast benefits of a healthy lifestyle. Their exposure to such valuable concepts will help lay a foundation from which they can establish health-conscious behaviors with a positive impact on their health and wellness. Cindy Medlicott and Anne Waidelich are serving as directors of the grant at the elementary school located in Corinth, Texas. This grant is one of several grants we have granted to Corinth Elementary. LCEF is supporting other initiatives at the school including the Corinth Elementary Life Lab, the Corinth Art Room Library and the Corinth Makerspace Book Zone. We have no doubt that all of these programs will be a success and an enrichment opportunity for the students at Corinth Elementary. In follow up to our first blog post announcing the grants Lake Cities Education Foundation awarded for 2017-2018, we’ve rounded up a few more on how our grantees will use their new grants. Each of the grants described below is making a big impact for students and staff throughout Dallas. Corinth Elementary library will feature a new Makerspace Book Zone as a result of a $4,861 grant enabling the school to purchase new books and materials for its students. This unique space will present exciting opportunities for students to explore hands-on learning and creating while continuing to develop their problem-solving skills and self-directed learning. This grant is directed by the school librarian, Sharon Simon. Led by Shirley Frase, the art lab at Corinth Elementary will soon be home to a series of books offering students insight on artists and art techniques. A grant in the amount of $861 will provide funding for a curated art library, opening up opportunities for elementary school students to learn and research art beyond their scheduled classroom time. Students in the Kid 2 Chef Competition Teams will use a grant of $2,463 to purchase the supplies and ingredients they need to prepare for their cooking competition. Through participation in the club, they have an opportunity to learn about different cultures, nutritional food choices, and the benefits of a healthy lifestyle, all in a cooperative learning environment. This grant is directed by Cindy Medlicott and Anne Waidelich. Led by Lake Dallas High School Health Services Coordinator Daine Ramirez, this $2,472 grant will be used to purchase new equipment for existing CPR courses offered to students and staff. The new equipment is a key component to enhancing Lake Dallas High’s cardiac emergency response plan as they strive to become recognized as a Project Adam Texas Heart Safe designated school. Bolstering the number of staff and students certified in CPR is a big benefit both to the school and the local community. A $2,403 grant awarded to Lake Dallas Elementary School will be used to implement a school-wide video broadcast system. Led by Technology Integration Specialist Katie Landaverde, the new technology will help enhance student’s aptitude in technology, media, film, videography and speaking. Lake Cities Education Foundation if proud to continue furthering our mission of enhancing educational opportunities in our community. In reflecting on the grants Lake Cities Education Foundation awarded for 2017-2018, we are thrilled to support existing and newly-launched educational initiatives throughout our community. We have awarded a total of $25,000 and will be sharing the stories behind the figures in our next two blog posts. Lake Dallas High School has been selected as a recipient of a $996 grant to fund a pair of goggles designed to simulate being drug impaired. These “drug impaired” goggles will provide students the first-hand opportunity to understand the considerable impacts drugs have on an individual’s motor skills and reaction time. The program sheds light on the dangers of driving under the influence and performing routine tasks when drug impaired. Health teacher Aaron Walterscheid secured this for the school and will serve as its director. Secured by special education math teachers Kenneth Imy and Sonia Foutch, this $2,478 grant will support both teachers in designing an ergonomic classroom. By cultivating a classroom environment that removes physical hindrances and addresses the specific needs of their students, Kenneth and Sonia will more effectively maintain engagement and focus in the classroom. With an emphasis on the importance of physical activity for an individual’s health, LDISD Adapted PE Instructor Riley Caughlin secured a $1,000 LCEF grant to support disabled students in a unique way. Mr. Caughlin will use this grant to teach fly fishing to students with academic, physical, social or emotional needs. Learning this activity will aid students in their development of academic, physical, social and emotional skills. The underlying hope is that the development of this new skill will impart in the students an appreciation for healthy leisure activities. A $5,000 grant will be used to fund CELL, a vegetable garden at Corinth Elementary School. By building, planting and tending this garden, students will develop math, collaboration, and problem-solving skills. They will learn about the life sciences through hands-on, involved instruction. The garden will have far-reaching influence at the school as it will also be used for language arts and social studies lesson. This grant will be directed by teachers Lynn Downs and Suzanne Murray, Technology Integration Specialist Michelle Richey and Assistant Principal Kerri Blevins. 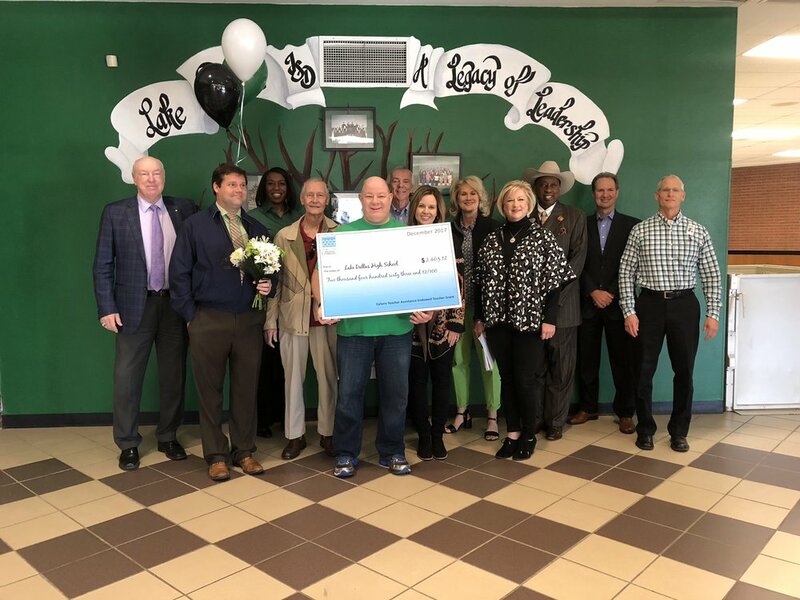 Recognizing the relevance of leveraging technology in today’s world, a $2,463 grant was secured by Lake Dallas High School Teacher Jimmy Moore to fund Chromebook laptops for his classroom. As a blended learning environment, Mr. Moore integrates traditional face-to-face instruction and technology to create unique learning opportunities for his students. The laptops will be utilized to facilitate lessons on education and training, human services, health science and law, public safety, corrections, and security. From funding the purchase of technology, to garden supplies and ergonomic furniture, Lake Cities Education Foundation grants are empowering teachers across Dallas. This is a selection of half of the grants we awarded for 2017-2018, we will share more funded programs in our next blog post. In its 17th year, the 2017 Lake Cities Education Foundation Gala and Auction was our most successful to date! Held on Thursday, November 16, 2017 at the Gateway Center of the University of North Texas in Denton, Texas, it brought our supporters together under one roof. Growing support of our annual program was evident in the numbers, 330 attendees joined us for an impactful evening featuring dinner as well as silent and live auctions! This annual event is LCEF’s largest fundraising event of the year. Proceeds from the gala help us further our mission of enhancing educational opportunities in our community. With the support of our sponsors and event attendees, we were able to raise over $80,000 towards this effort! The funds raised will be applied towards grants for Lake Dallas Independent School District teachers and scholarships for graduating seniors of Lake Dallas High School. Generous in-kind contributions made by our supporters allowed for a wide variety of raffle and auctions items. Among the incredible auction items available was a tailgate dinner for 50 people, a South Padre Island getaway in beachfront 4 bedroom condo, an autographed football by Dak Prescott, and a Canon camera, just to name a few! A special segment of the program featured videos highlighting two recent endowments, the Robin Hasserd Memorial Teacher Grant and the Tonya Monden Future Educator Scholarship. In one of the videos, Deputy Superintendent/CFO Wes Eversole is quoted stating, “the funds that are generated by the LCEF…certainly give our students opportunities that they may not have without this funding.” The major contributions we are able to make would not be possible without the support of our donors, sponsors and volunteers! Thank you all of those who supported the LCEF Gala and Auction, we would not be able to further our mission without you by our side. Since 2000, the Lake Cities Education Foundation has awarded over $209k in teacher grants and over $366k in student scholarships! We would not be able to have such a tremendous impact on the Lake Dallas Independent School District without support from individuals and businesses in our community. If you’re looking to support our mission but don’t know where to start, we’ve drummed up a few ideas. Volunteers are the backbone of the Lake Cities Education Foundation. As an organization run by an all-volunteer Board of Directors, we recognize that the time and talent our volunteers give is invaluable. There are many opportunities for volunteer involvement, including helping out with the upcoming LCEF Annual Gala!! The 17th Annual Lake Cities Education Foundation Gala and Auction promises to be a good time in the name of education! To be held on Thursday, November 16, 2017, the program will feature a silent auction and dinner followed by a live auction. The Annual Gala presents an excellent opportunity for corporate involvement, table sponsorships are available for $800. Individual tickets are available for $65. Unable to join us at the gala but still interested in participating in the auction? We are using Qtego, a mobile bidding platform, to enable you to bid remotely! Look for the link on our website and Facebook page closer to the gala date. Charitable donations, big or small, go a long way in supporting our mission of enhancing educational opportunities in our community. If you’d prefer to make an in-kind donation, we are currently accepting donations for the silent and live auctions featured at the Annual Gala. Making an auction donation is made possible by our volunteers, who are available to pick up items you’d like to donate. Remember, both forms of donations are tax deductible! If you would like to support the Lake Cities Education Foundation but aren’t sure how, we would welcome you to join us as a volunteer, as a LCEF Annual Gala attendee or as a donor! Would you prefer to talk to us about opportunities for involvement? Reach out to us today. Every year, we get together to celebrate and support our mission here at Lake Cities Education Foundation. The Anniversary Gala and Auction plays a vital role in our ability to provide grants and scholarships to the Lake Dallas Independent School District community. So far, the LCEF has awarded $209,760.35 in teacher grants and $366,050 in student scholarships. Want to join in on the celebration? You’re invited to participate in the 17th Annual LCEF Anniversary Gala and Auction on November 16, 2017! The event will take place at the Gateway Center of the University of North Texas in Denton, Texas. Please note, we will be using a different venue than previous years. This event is a black tie affair and tickets can be purchased by contacting anyone with the LCEF team. You can participate in the silent auction or make a donation whether or not you plan to attend the actual event. Using a system called Qtego, we are able to offer a preview of the auction items, and open silent auction bidding before the event begins to those who are able to attend and those who aren’t. We will post the Qtego link on our website and Facebook page no later than November 14th, so be sure to check! Go ahead and visit our website as well if you’d like to contribute by making a donation. We welcome auction donations from any and all. We greatly appreciate any items you’d like to donate, large or small, and our volunteers will come pick them up. If you’d like to donate, please fill out the Sponsor Form completely by November 10th so that you may be properly recognized. Thank you for your support and celebration of the LCEF! We could not do what we do without you. On Monday, June 5, LCEF supporters and friends got together for our annual golf fundraiser, the Memorial Golf Tournament. Held at the Oakmont Country Club, the tournament was played in a four-person modified scramble format. The Memorial Golf Tournament has raised more than $510,810 over the past fifteen years. This money makes a huge impact on our ability to fund scholarships and grants for Lake Dallas ISD students and teachers. Making those scholarships and grants accessible is our mission, and this annual golf fundraiser allows us to continue to make an impact on the lives of deserving students and teachers alike. Last year, the LCEF was able to award $37,000 in scholarships and $21,700 in teacher innovative program grants. From all of us here at the LCEF, we want to extend a huge thank you to all of the participants in this year’s Memorial Golf Tournament. Without you, we wouldn’t be able to do what we do. And, we had a ton of fun! We want to take a moment to announce the winners of this year’s Memorial Gold Tournament! The winners of the morning flight are the lovely gentlemen of the Lake Cities Fire Department – Chad Thiessen, Adam Scott, Patrick Walsh and Zach Wardlaw. The Fathers and Sons of DMS Architects, Raymond Darrow, Stephen Darrow, Richard Owenby and Brian Owenby took first place in our afternoon flight. Lake Cities Fire Department – Chad Thiessen, Adam Scott, Patrick Walsh and Zach Wardlaw. Thank you once again to all who participated! We’re already looking forward to next year! It’s almost that time of year again! We hope you and your family have made some amazing memories this summer. Now it’s time to get ready to send the kids back to school. Take a look at our list of essentials to set them up for success this school year. The basics can change depending on what grade your child is going into, but overall you’ll want to make sure they’re stocked up on the regular necessities each year. If your child is middle school or high school-age, it’s a good idea to equip them with a graphing calculator, protractor and ruler, scissors, personal organizer/calendar and book socks as well. And don’t forget a combination lock if they’ll be using a locker! Creativity is a huge part of learning. Whether your child has a knack for the arts or is more interested in math and science, giving him or her an outlet for creative expression will only be beneficial to the learning process. Send your kid back to school with colored pencils or markers and a notebook dedicated only to drawing. Invest in music lessons or encourage them to try out for the school play this year. Whatever you choose, giving your child the option of a creative outlet will help direct excess energy and develop his or her brain along side strictly academic subjects. Another tip for back-to-school is to get your kid a water bottle to take with them throughout their day. Let them pick it out, or make it a fun back-to-school gift from you. Encouraging your child to stay hydrated will help their overall health, curb hunger during class and set good habits from an early age. Making sure your child is prepared for back-to-school will set them up for a successful school year. Help make their time in the classroom as fulfilling as possible by donating here. When you were in school, a trip to the middle school library meant looking through the shelves for books or learning to use the card catalogue to do research. If computers or other technology were involved, it was mainly to take the purpose of the card catalogue. Things have changed a lot since then. In the midst of video games, smart phones and other distractions at their fingertips, middle school students have lost the joy for reading. A trip to the library isn’t nearly as exciting as a surfing the web or chatting online. Library Media Specialist Desi Beard from Lake Dallas Middle School aimed to change the reading experience for her students. With the popularity and availability of e-readers, Ms. Beard saw an opportunity to bring books and reading support to the hands of her students in a way they would enjoy and understand. She wrote a grant to purchase 30 Kindles. For the less technologically inclined, Kindles are the electronic reading devices put out by Amazon. The software is free on any smart phone, tablet, laptop or computer. However, the Kindle devices themselves are not free. The advantage to purchasing them is that they come with additional reading support, which is helpful to many middle school students who struggle with the skill. For Lake Dallas Middle School students, a trip to the school library now means a class period, or more, that’s engaging and helps them learn in ways that make sense to them. Reading is now more fun because books and magazines are presented in a familiar format – electronic. You may mourn the passing of books, but your middle school students are more engaged thanks to Ms. Beard’s insights about using Kindle readers to bring books to her students. We’re proud to be able to support Ms. Beard’s efforts to help her students love reading and books as much as she does – no matter what the format. Learning basic reading skills is one of the most fun, and challenging, parts of the Kindergarten curriculum. Many students need to engage other senses to truly master this skill. Sound and hands on learning experiences can make learning to read more fun and easier for students struggling with the skill. Ann Lenard from Shady Shores Elementary School saw her students struggling with the reading curriculum and wanted to facilitate a means for them to feel excited about reading. After looking at many options, Ms. Lenard determined that the LeapFrog Interactive Reading Center would be perfect for her classroom. We happily awarded her a grant of $533.90 to purchase the system for her classroom. In conjunction with the Lake Dallas Integrated School District curriculum, students will be able to discover reading from the ground up. Basic lessons help students associate letters with their sounds. More advanced lessons help more independent readers develop confidence in their skills and discover enjoyment in solo reading. Every lesson, at every level, is interactive and student focused. By using interactive books, LeapFrog supplements students’ phonemic skills and reading comprehension. As students progress through the program, they become more comfortable with reading, both silently and aloud. This provides them a foundation for the rest of their school years. Many teachers use round-robin oral reading to teach and engage their class. Students with a fear of reading often find these classes challenging, even when they understand the subject matter. We’re excited to see the results of the LeapFrog Interactive Reading Center in Ms. Lenard’s classroom, as are the parents of her students. 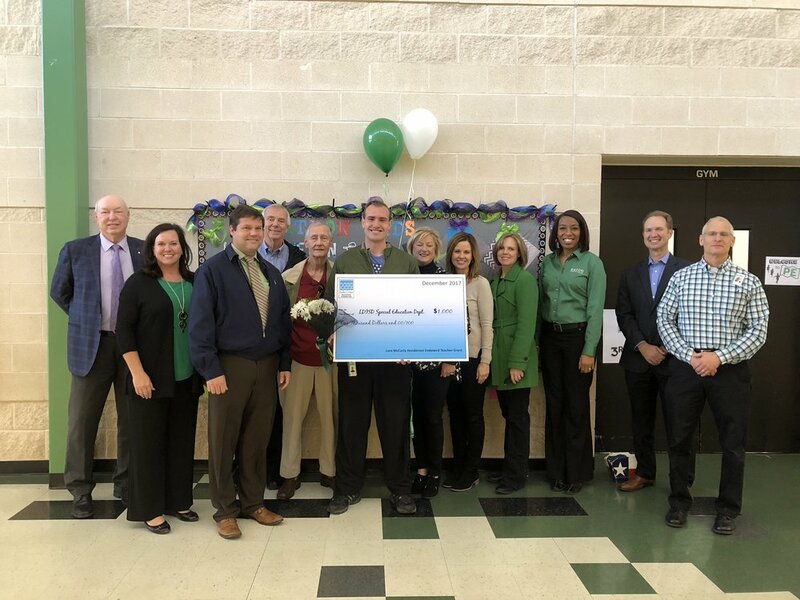 As with all our grant recipients, we’re excited to bring additional educational opportunities and avenues to all of the Lake Dallas Integrated School District. What technology or equipment would help improve the learning environment of your classroom? Let us know through a grant application – you just might get exactly what you and your students need!